‘Vasuvum Saravananum Onna Padichavanga’ talkie wrapped up! Director Rajesh’s upcoming venture with Arya ‘Vasuvum Saravananum Onna Padichavanga’ (VSOP) making is going on a fast pace. 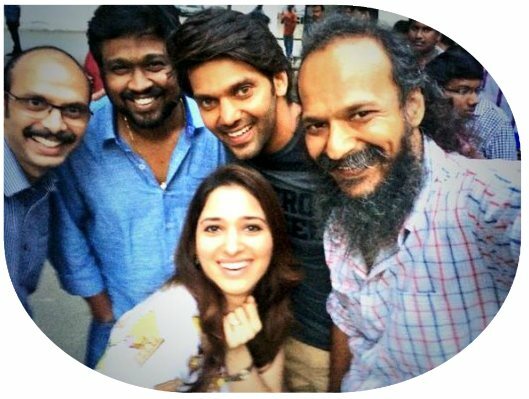 Home » Arya | Director Rajesh | Santhanam | Tamanna | Vasuvum Saravananum Onna Padichavanga » ‘Vasuvum Saravananum Onna Padichavanga’ talkie wrapped up! Director M Rajesh has wrapped up the shooting of talkie portions in Vasuvum Saravananum Onna Padichavanga. The film’s shooting has been going on in Pondicherry for the past several days. According to sources, only two songs in the film need to be shot and the director will be doing it soon. VSOP, which also features Arya's best friend and comedian Santhanam, will be high on bromance, along the lines of their last film "Boss Engira Bhaskaran", says Arya when talking about the movie. "Santhanam and I are having a ball shooting for the film, which is nearing completion. It will be high on bromance and funnier than our last film. I feel Santhanam and I make a great comic combo on screen," Arya told IANS. Starring Arya and Tamannah as the lead pair, VSOP has Santhanam in an important role. Vishal has done a guest role in this comic caper while Imman has composed the music. With the shooting wrapped up, sources say that VSOP may be out at the theatres this summer. After VSOP, Rajesh is likely to direct a film with Jiiva with whom he has already gave a hit, Siva Manasula Sakthi.